Blessed is the season which engages the whole world in a conspiracy of love! I forgot how fun Secret Santa's were until we were invited to join our "Kris Kringle" exchange at work. I don't usually feel like I am good at this. Inveritably, I wrap a gift thinking it is pretty good...until I my Secret Santa gives me an awesome one. Then I feel bad for the recipient of mine. This year I feel pretty good about my gifts. This year, we were limited to the amounts, so that made me feel a "little" better. The first gift had to be a religious item. I found a really awesome necklace with a cool cross and bible saying. The next was snacks! My reciepient's request was sweet/chocolatey. I decided to go out and buy some candies. When I realized I was going to fall into my old ways and just stick the candy in a bag...I halted all insane action. 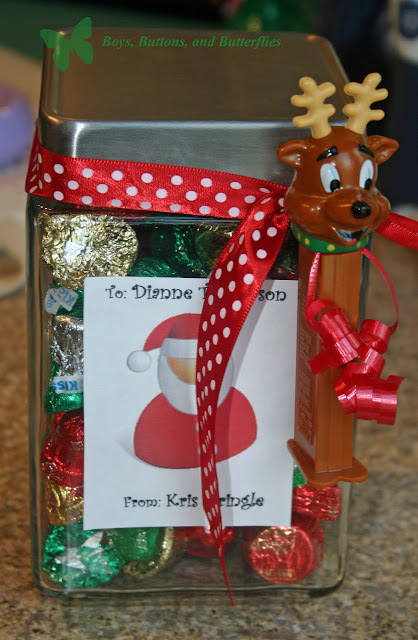 I found this great INEXPENSIVE jar at Target and decided to fill it up with the chocolate. I then wrapped ribbon around the top (using double-sided tape on the inside to prevent sliding and twisting). Added the Reindeer pez dispenser (isn't he cute!). I then simply printed out a label by finding a great clipart on Microsoft Word. Added double sided tape to the back. Not too bad, is it? I was thinking this would be great as a gift for co-workers, neighbors, the local drycleaner...whoever might like a bit of Christmas cheer that doesn't break the bank!!! Fireworks, Family, Fun, and Fizz....Goodbye 2010!